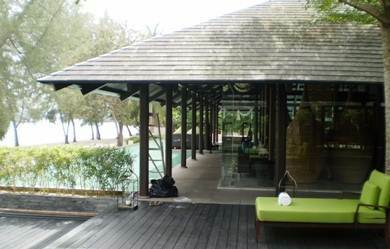 This is a great luxury resort in Kuah and touted as the second best after Four Seasons. But sometimes even the second best could be voted as the best when you consider its location advantage. Located at the capital town of the Langkawi, Westin is only few minutes drive from the heart of the town, glittering shopping centers and plethora of restaurants that by itself makes good enough reasons for many to visit the island. And to top it all, it has a private exclusive beach of its own and the only one in the whole of Kuah town. From the town a secluded road through posh locality leads up to the resort. From the Eagle Square which is the main symbolic landmark of Kuah, the resort is only 2kms away. You will first drive up to the main lobby area which is really huge and impressive. A Customer Relationship Representative walks up to you and personally ensures that you have a smooth check in. If you have family with kids, they offer a nice surprise pack for your kids. The entire resort is setup in a serene and lush green setting with paved pathways connecting all the points within the property. Some rooms and facilities can be quite far from the main lobby. You can either choose to walk or ask for a battery operated cart to get around. While you check in, ensure that you get a room that has been recently refurbished. Westin is in the process of upgrading its rooms and the older rooms are not the ones that you want. The refurbished ones are modern and have better amenities. Another thing, some rooms have view of tropical gardens, some of the pool and the sea beyond. So while checking in ensure that you have one of your choice. We would not take up rooms that face the driveway. There are several categories of rooms & units in Westin and you choose one depending on how much you want to shell out from your pocket. The Superior Rooms in general have no great views, but have a patio where you can walk up to and enjoy some privacy. The rooms have neutral tones and modern furnishing. The Deluxe Rooms are quite spacious and overlook the pool & the sea or have a garden view. There is a glass wall between the bathroom and the bedroom. Strangely the shutter on this glass wall is on the bedroom's side. So anyone in the bedroom can actually lift the shutter and peep through :) No bathtub in the bathroom. The rooms are otherwise very nice with wooden floorboard and teak molding. Many rooms have connecting doors to the adjoining rooms. However the door remains closed unless you are in a family occupying both and want it opened. But even while closed, this does pose some problems with noise proofing. If you have a noisy family in the next room, you may lose the quietness and tranquility that you are paying for. The Premium Rooms are even better and have sweeping views of the Andaman Sea. They have private balconies and wooden patio. Still no bathtubs in bathrooms. There are several types of suites - Ocean Front, Executive and Royal. Some facing the garden and some having excellent sea view. They have separate lounge area, bedroom and a private terrace. These suites have bathtubs in the bathrooms :) The two-bedroom suites additionally have private gym equipment and Jacuzzi. But if you can afford, try out our favorite one-bedroom villa. It's fantastic and having unabated view of the water. The private terrace is awesome for a great romantic dinner. The villa has a private infinity pool. The Premium Villa additionally has a private Jacuzzi. All rooms have complimentary wi-fi, plasma TV, DVD player, tea/coffee maker, hair dryer, writing desk, air conditioner & climate control, mini bar, electronic safe, shaving kit, iron & board etc. The complimentary buffet breakfast served is really excellent with all kinds of choices that you can think of. To add to it, they offer free flow of sparkling wine. There are several dining options in Westin. The Breeze Lounge serving International cuisine is located at the main lobby area and has a great sea view. With a large space, plush couches and laid back atmosphere, it's an excellent place to dine and have some great cocktails. There is a large oval shaped metallic structure in front that gives an impression of swirling storm in strong breeze. It's open from 9am until 1am. A resident live band plays in the evening. Anjung Damai is perfectly setup for a romantic dinner with a backdrop of the sea. It too serves International cuisine and opens from 7pm for dinner only. Reservation is a must here. But if you want an ultimate romantic dinner, go for the Float (which is our top favorite). This is a floating private jetty of Westin which is surrounded by the sea water. You can have a superb candle lit dinner. They are open for dinner only (from 7pm) and serve International cuisine. However the most popular in Westin is the Seasonal Tastes Restaurant that serves Malay and International cuisine in a buffet style. 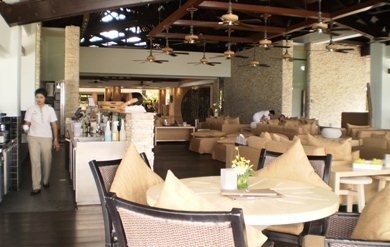 You can either dine privately in a crystal cove booth, or al fresco or at the covered patio with sweeping view of Andaman Sea. The menu changes frequently and is combined with select list of wines. The restaurant also serves health food. It's open for breakfast, lunch and dinner (7am to 10:30am). Like any other Westin Group of hotels, there is no single amenity which is left out here. This resort has been designed to meet almost all desires that one can have. There are several pools in Westin. The best in the lot in my view is the Infinity Pool. 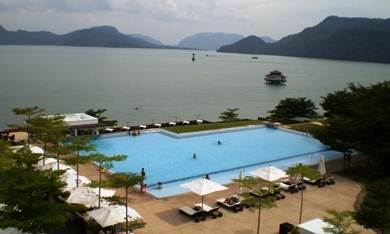 This large pool at one end blurs the boundary with Andaman Sea. Next to it is a whirlpool. The Ocean Rock Pool has rounded rocks surrounding it and nestled in a lovely tropical garden. And there is also a kids pool in the premises. The private beach, although not a long stretch of sand, is powdery white, clean and lovely. However sometimes we have noticed red ants there. If you like to indulge in Spa treatments, you don't need to go anywhere to get some of the best spa treatments available in the island. The Heavenly Spa is tucked in a corner. From the lobby lounge you will be escorted by a cart to this serene spa located at one end of the private beach and overlooking the azure waters of the sea. The spa is huge and has a spa pool for itself. It offers many different kinds of treatments including massage, facial etc. All treatments here begin with a massage of the head, neck, ear and scalp using aromatic oil. The spa has its own Jacuzzi, Ayurvedic treatment room, Turkish Hammam etc. The resort organizes water sport activities like snorkeling, kayaking, sailing, scuba diving etc. The tour desk at the lobby organizes nature excursions, adventure tours, geopark boat tour, mountain biking, jungle trekking and lot more. There are two flood lit tennis courts in Westin. The fitness center is well equipped with modern fitness gears. The Westin Kids Club offers lots of fun activities for the children for a fee including lessons on animals & plants in Langkawi, games, some adventures and more, and all this complimented with tasting local food. 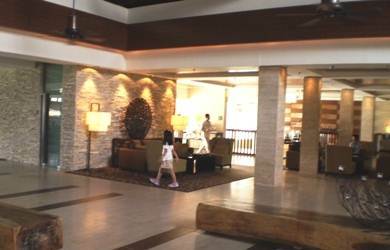 Westin Langkawi has six meeting and banquet rooms that are meant for conferencing and events like wedding reception etc. Westin offers professional services for wedding ceremonies and receptions. Other than at the banquets, the couple can choose romantic venues like the floating jetty (Float) or the private beach for their wedding venue. Overall the service in Westin is excellent. The staffs are well trained, friendly and always polite.